With Love, Antosha premiering at the Sundance Film Festival, Anton’s parents, Viktor and Irina, spoke with Los Angeles Times about moving forward, making the documentary, and more. Such a heartfelt interview. Anton Yelchin’s parents live where their son died. After his sudden death nearly three years ago, Viktor and Irina Yelchin couldn’t bear the thought of selling Anton’s home. He’d been obsessed with the place in Studio City, planting himself on his recliner sofa most nights with a bowl of pretzels, his Brussels Griffon, Elvis, and a stack of movies to watch until 3 in the morning. So even though it was in the driveway that his Jeep malfunctioned in 2016, rolling downhill and pinning him against a gate, this is where his parents felt they had to be. The couple have already done a number of things in tribute to their son, an actor who amassed close to 70 film and TV credits — ranging from the most recent “Star Trek” reboots to “Hearts in Atlantis” and “Curb Your Enthusiasm” — before his death at the age of 27. They erected a statue in his likeness at Hollywood Forever cemetery and donated $1 million to the newly named Anton Yelchin Cystic Fibrosis Clinic at Keck Hospital of USC, where he received treatment for the disease. But at the Sundance Film Festival this month, they’ll debut their greatest labor of love: “Love, Antosha,” a documentary that celebrates the actor’s legacy. Read the full interview at Los Angeles Times website. Anton’s family and friends came together at the opening night of Anton Yelchin: Provocative Beauty, an exhibit that features photos from Anton’s six-year photography work, at De Buck Gallery in Los Angeles last December 13th. Kristen Stewart (from Fierce People), Ben Foster (Alpha Dog), Bryce Dallas Howard (Terminator: Salvation) were among his co-stars that were there to support. The exhibit will run until January 20th. Last year, there was an exhibit that showcased Anton’s photography in Los Angeles. This time, it’s New York’s turn. De Buck Gallery will be hosting the exhibit, which features 54 photos from Anton’s six-year photography work. The exhibit will open on December 13th and will run until January 20th. For more details and the gallery address, visit the De Buck Gallery’s website! NEW YORK—De Buck Gallery is pleased to present Anton Yelchin: Provocative Beauty. The exhibition will open Wednesday, December 13, 2017 and will remain open until Saturday, January 20, 2018. The selection of 54 mages spans from a productive 6-year period of photographic exploration. At the time of his tragic passing at the age of 27, unbeknownst to most of his friends, Anton was pursuing a second career as a photographer. During this period, he documented a wide range of subjects using a Leica camera as well as disposable cameras. This exhibition focuses on portraits, self-portraits and interior images that Anton captured while exploring this private world. These photos include many intimate portraits of friends, family and also complete strangers. All of these people trusted Anton to convey his intimate interactions with them. Anton was known primarily for his work as an actor in films such as Star Trek, Green Room, Like Crazy, Terminator: Salvation, Alpha Dog and many more. Yelchin’s career began as a child when he received rolls in Curb Your Enthusiasm, The Practice, Hearts in Atlantis, Delivering Milo, and ER. Passionate about photography since childhood, Yelchin was embarking on a second career as a photographer at the end of his short but beautifully-lived life, having been commissioned to shoot for a number of international publications. 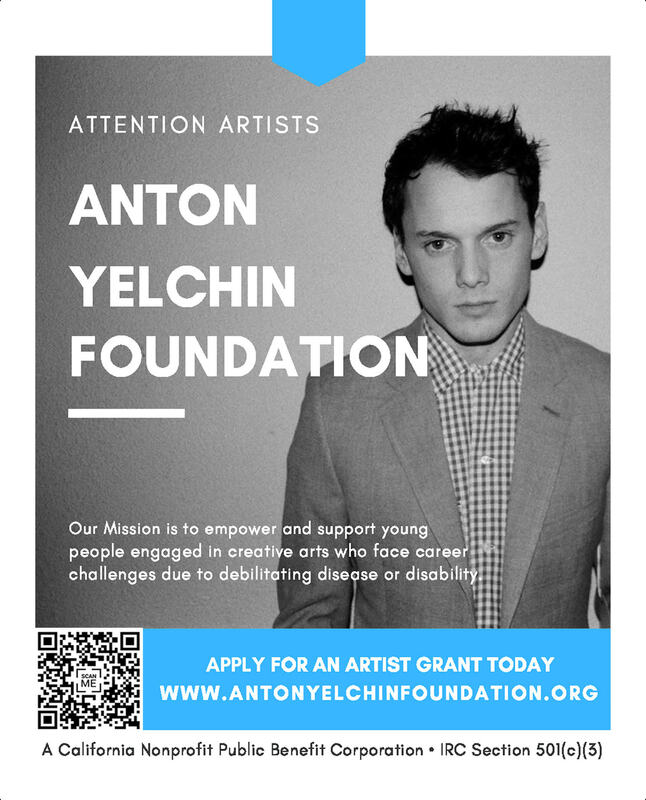 De Buck Gallery wishes to honor the legacy of Anton Yelchin’s life and to recognize the tremendous creative energy, output and talent that he possessed. The artist’s portion of proceeds from sales will be donated to the Anton Yelchin Foundation. These funds will be used for a variety of programs empowering artists who face career challenges due to debilitating disease or disability. The exhibition is co-curated by Clayton Calvert and Rachel Vancelette. Anton was commemorated by his family and co-stars yesterday in a touching celebration of his life at the Hollywood Forever Cemetery in Los Angeles. Via People.com, here are some details from the ceremony. Fred Parnes, director of the 2000 film A Man Is Mostly Water, also gave a speech. “I’m here to say that we owe it to Anton to lift our souls evermore, to choose celebration, to choose exaltation and jubilation. The longer I live, the more I’m aware of how little I actually know. But I’m absolutely certain that that is what Anton would want. I can hear him say, ‘Yes, dude! Celebrate my life. Do something unexpected in my name, travel the road less taken and then tell me what you found.’ That’s what he would want and I refuse to let him down,” he said. Among the guests are Jennifer Lawrence (co-star from Like Crazy), Simon Pegg (co-star from Star Trek), Emile Hirsch (co-star from Alpha Dog), Jon Voight (co-star from Court of Conscience), J.J. Abrams (director of Star Trek), Drake Doremus (director of Like Crazy), and Jeremy Saulnier (director of Green Room). The tribute wall from last year’s Star Trek Las Vegas convention was also on display at the ceremony. After the celebration, guests gathered in the Garden of Legends for the unveiling of Anton’s statue. It was created by sculptor, Nick Marra, and FX artist, Greg Nicotero. I have added some photos in our gallery. Some are not that high-quality, but I got what I could get. And it still feels more like a private event, so I only added a fair amount of photos. Like Crazy director, Drake Doremus, shared a moving two-minute video tribute to Anton yesterday. It features candid and behind-the-scenes moments from when they were filming the movie. It’s such a moving, heartbreaking video with a simple message that hits too close to our hearts. An exhibit showcasing Anton’s photography is now open to public viewing at Other Gallery in Los Angeles, and will remain on display until the end of the year. The tribute wall signed by fans at this year’s Star Trek convention is also part of the exhibit. The opening was held yesterday, and some celebrities were there in attendance, including Star Trek co-stars Chris Pine and John Cho, and directors J.J. Abrams and Drake Doremus. I have added some photos into the gallery! Update: The address for Other Gallery is 1050 N Cahuenga Blvd, Los Angeles, CA 90038, for those who would like to see the exhibit. Thanks to @Nien_Nunb for the info! Here are 2 scans from the tribute articles in next month’s issue of Total Film magazine.